Piping hot out of the oven, or room temperature on a sizzling summer day, roasted veggies serve as a perfect side dish to just about anything. The variety of flavors you can unearth from diverse spices and oils allow you to adapt your dish to go perfectly with a roast chicken, seared salmon, or simply grilled steak. The irresistible crunchy, caramelized edges, warm tender center, and rustic quality remind me of Italy. There’s a time and place for perfectly cut vegetables, but it’s not in my kitchen. The more time I can spend enjoying the food and less time prepping the better, especially on a busy weeknight. No need to stress yourself over perfect knife cuts – I know chefs everywhere are cringing over that statement – but honestly, as long as they’re all about the same size they will cook evenly and that’s all you need. 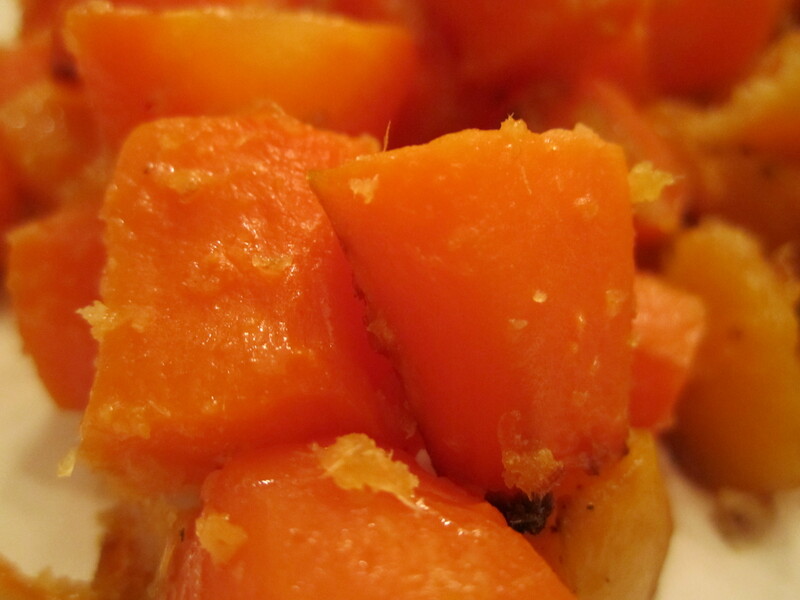 The fresh, clean tang of ginger contrasted with the sweetness of the carrots help brighten their natural flavor. Garlic slowly warmed in the oven with a coating of healthy olive oil; mixed with the deep, creamy earthiness of butternut squash is a blissful combination. The two together were simply flawless, and set side by side with a grilled steak and you’ll feel like you’re in paradise (or an Italian vacation in the middle of Tuscany). Wash and peel squash, and cut it into bite size squares. 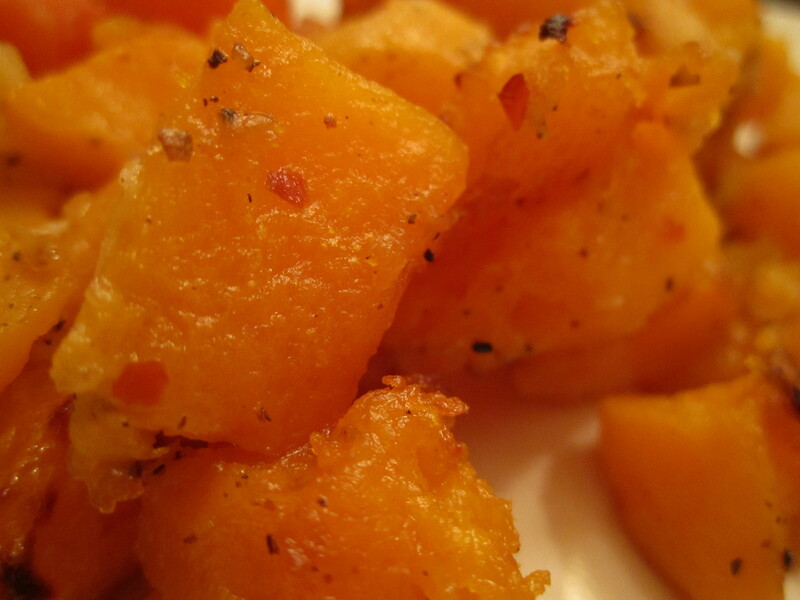 Place squash in a glass baking dish and drizzle with extra light olive oil. Extra light olive oil has a higher burning temperature so I find it better for roasting. Due to valuable antioxidants and ability to help lower total cholesterol, I always use extra light olive oil as a substitute for butter, shortening and other vegetable oils. Sprinkle with garlic, salt, ground black pepper and crushed red pepper and mix with a spoon until the squash is evenly coated with oil and seasoning. Watch the oven, as the broiler will be hot and will burn the squash if left unattended. It goes quickly, all you’ll need is 2-3 mins. Once the butternut squash gets a slight golden color to the edges remove from oven and let cool for 5 mins before serving. 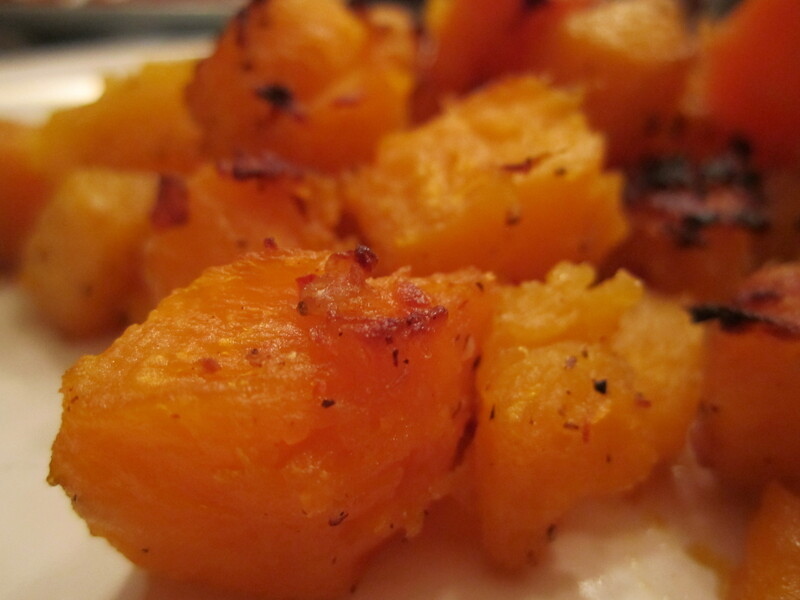 Place all the squash in a glass baking dish and drizzle with extra light olive oil. Extra light olive oil has a higher burning temperature so I find it better for roasting. Due to valuable antioxidants and ability to help lower total cholesterol, I always use extra light olive oil as a substitute for butter, shortening and other vegetable oils. Sprinkle with garlic, salt and ground pepper and mix with a spoon until the squash is evenly coated with oil and seasoning. I didn’t grow up eating meatballs; they were very foreign to me. I was raised on Italian Bolognese, shepherds pie, and bacon sandwiches. Yes, bacon sandwiches are just as they sound, toasted bread, ketchup, and bacon. I simple, peasant style dish originating in the UK, and often called the “hangover cure”. But that isn’t on today’s menu. Today we’ll be having a much healthier meal, but just as satisfying. OK, back to the meatballs. My idea of meatballs was a dense, dry rock of unseasoned meat, or if you want to get even classier, those artificially tasking Chef Boyardee meatballs swimming in a thin copper red sauce – a far cry from a basic tomato sauce. I can’t remember where or when this happened, but I eventually got over my fear. The variety of flavor combination you can get from one simple dish never leaves you bored. Italian, Swedish, Irish, Spanish… each culture has their own take and I urge you to try them all, and make some of your own. Now you don’t hear of a “Chinese meatball” very often, but why not? I incorporated all the same flavors you get in a stir fry and toss it with some Japanese udon noodles and you have a perfect fusion of flavors and textures. Place a large pot of water with bullion cubes on to boil for the noodles. 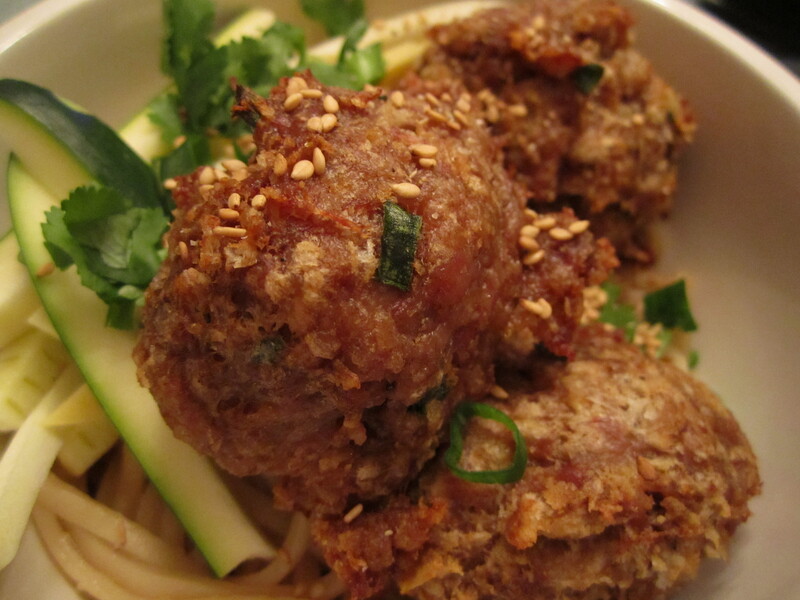 The bullion helps flavor the noodles without overpowering your palate with soy sauce. When it comes to a boil. Lower it to a simmer until you put the meatballs in the oven, then it’s time to bring it back up to a boil and cook your udon noodles, don’t worry, I’ll let you know when to come back to these. 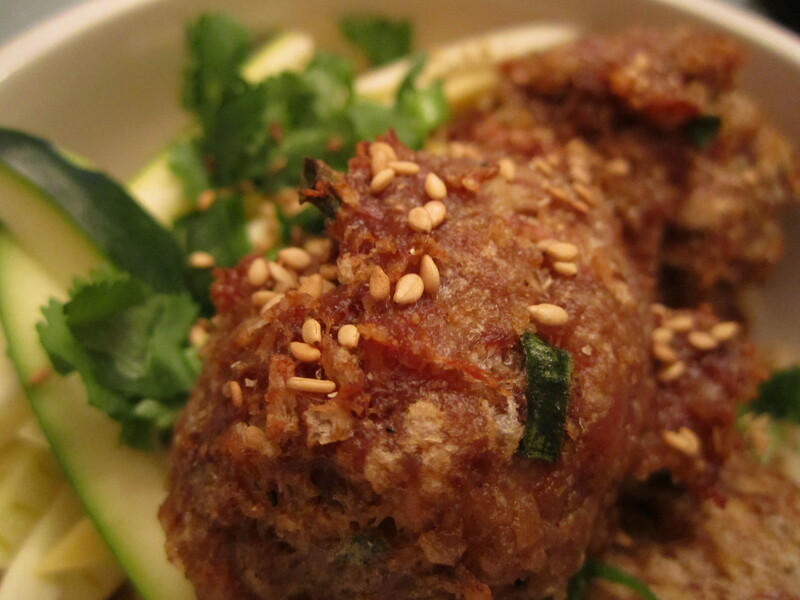 Place the pork in a mixing bowl along with an egg, five-spice powder, scallions, ginger, garlic, soy sauce, sesame seed oil, salt, pepper, and panko breadcrumbs. Mix gently but thoroughly with your hands. If you use a spoon you will likely over mix the meat and you’ll end up with tough, dry meatballs. Form 1 1/2-inch balls and place on a baking sheet. Brush the meatball with extra light olive oil and roast for 15 mins. Now that the meatballs are in, bring your water back up to a boil. Follow the directions on the noodle package. While the noodles and meatballs cook, julienne the squash and zucchini and set aside for garnish. Roughly chop a good handful of cilantro and thinly slice 2 scallions for your garnish. When your noodles are ready, drain and return to pan. Toss noodles in 2 tbsp. olive oil and 1 tsp. sesame seed oil. When the meatballs are ready, remove from oven and assemble your dinner. Begin by placing noodles at the bottom of your bowl. Add meatballs and slices of zucchini. Garnish with toasted sesame seeds, scallions and cilantro.